Today, I thought I’d do a bit of a fun post. And since this is the first type of post like this, we’ll see how it goes. There are so many people here! It’s great! Being in a crowd of thousands of other Catholics there for the same reason as you can be exhilarating. And it proves that we are not alone in our love of and fight for our faith. And the energy of all those people together can be amazing. There are so many people! I need space! While so many people gathered in one space can be exhilarating, it can also be overwhelming. I can’t wait for Adoration! Every FOCUS conference I’ve been to has had a conference-wide Adoration. During this time, we get to worship Jesus in the monstrance, together. And during this time, people also have the chance to go to Confession. I’ve used this opportunity in the past, and going to Confession at the same time as many others is a powerful experience. Adoration and Confession night has to be my favorite part of FOCUS conferences. I didn’t get to go to Confession during Adoration. Oh look, a priest! One of the great things about FOCUS conferences is the amount of religious in attendance, especially priests. It’s great getting to talk and hang out with them. But if you want to go to Confession and don’t know where the Confession room is or didn’t get to go during Adoration, you can just ask a priest and they’ll be glad to hear your confession. And if they can’t at that moment, they’ll help you find a priest that can. Oh, my knees! One of the downsides of FOCUS conference Masses is having to kneel on concrete for so long. Without anything between your knees and the concrete. Your knees can get real tired, real quick. We can get innovative quickly, putting kneeling pads under our knees. And if we don’t have kneeling pads, a jacket or sweater could work as well. Which Impact Session(s) do I want to go to? 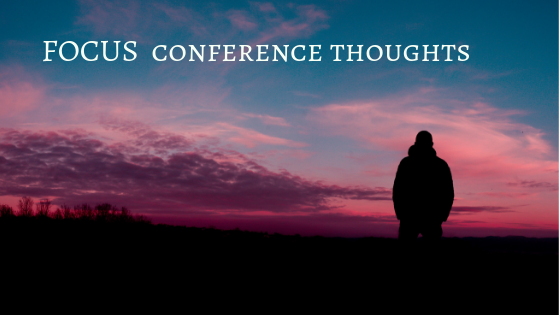 FOCUS conferences (especially SEEK) provide amazing speakers and talks on a wide range of Catholic topics. And with so many amazing talks to choose from, it can be difficult to choose which ones to go to. If there are several ones you want to go to, you and a friend (or multiple friends) can split the talks between yourselves, each going to a different talk. That way, you can share notes later. I’m so tired, but it’s so worth it. FOCUS conferences are jam packed with Mass, talks, and activities and every day takes a lot of energy. But the experiences each day make it worth it! If there are any thoughts I left out, please comment below! I’d love to hear them!